Tanja comes all the way from Australia to ride in this event. Kellie was the 2017 Top Hand Champion and is returning again in 2018 to defend her title. A top five contestant in the Amateur Top Hand in 2016. Phil will be with us again in 2018. I grew up in the east bay suburbs riding at a competitive three-day eventing and dressage barn. By the time I had graduated high school, I had evented through preliminary level, and obtained my bronze medal in dressage. I had been a working student for my trainer, and thought that had qualified me to buy and train a two year-old gelding. The gelding turned out to be pretty difficult to handle. He had minimal training and quickly took care of my ego problem. Out of necessity I began to learn some horsemanship skills from some good trainers and friends who were better horsemen than I was. I graduated from UC Davis with a BA in English and a feeling of uncertainty about my future right after the dot com bubble burst. I still didn’t know what I wanted to be when I grew up, but I was lucky enough to land a job training at the eventing barn where I grew up. In time, I realized that being a horse trainer wasn’t just a job for me, it is who I am. I got some more education and teaching certifications with CHA and USEA, along with some USDF year-end awards. I also got two broken legs, a few concussions, a damaged wrist, and a spinal injury. It’s not that I was falling often, only twice in my time at that barn. I’m just not very durable. I’m fined boned and I’ve literally been blown over by a gust of wind before. I was fed up with being the barn’s crash test dummy, so I quit and headed to a job in an office, where I wouldn’t get cold in the winter, overheated in the summer, and injured on a regular basis. I got a job in Human Resources in the Silicon Valley. It only took a couple months before I took on a few riding students in the evenings after work. I plugged away at my corporate gig for about five years before I had a conflict with my boss and I quit. I had intended to get another job in human resources, but within two weeks, I had a full client list at the barn where I boarded my gelding. Working with horses was different this time. I’ve been able to explore different aspects of horsemanship and truly develop my own style because of the autonomy that comes with being my own boss. 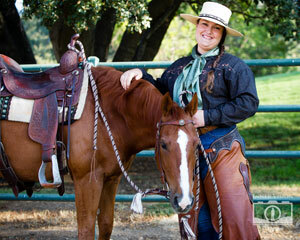 I started working full time in my business, HC Equestrian, in Milpitas, California, in 2011. HC Equestrian is based at Indian Hills Ranch, which is much more diverse than the training barn I had previously been a part of. We have room for 215 horses at our barn, and we have a very eclectic collection of breeds and disciplines. I love all horses, and have been delighted to help all sorts of people and horses over the years. My current client list includes gaited horses, 100 mile endurance horses, pony club horses, ranch horses, hunter/jumpers, working equitation horses, breed show horses, dressage horses, eventers, and Cowboy Dressage horses. I thrive on the variety, and borrow exercises across disciplines to make each horse softer, stronger, and more confident. For a while I continued down the path of competitive dressage, earning my silver medal and graduating the USDF L program with distinction. I also became the coach for Santa Clara University’s Intercollegiate Dressage team. Intercollegiate dressage is a catch riding competition; riders have 10 minutes to warm up an unfamiliar horse before riding their judged test. I was always a little bit jealous of the students at the competitions because catch riding competitively seems so fun! The opportunity to potentially compete in a catch ride competition is what excites me most about the top hand. After my daughter was born in 2014, I was hired to work with a mustang gelding named “River” that had given his owner some trouble. He had a couple months of basic training, but had several issues that made him not suitable to be her reliable pleasure and trail horse. I knew of River because he had a reputation for running away from people any time he got the chance. He had been at Indian Hills since he was a yearling, and I had caught him several times when he would jump out of his pasture, or break loose from his handler. It’s been a few years now, and River is much more of a solid citizen. I use him as a buddy horse on the trail, pony youngsters off of him, he can teach beginner lessons, take a junior rider to dressage shows, and me to working equitation and Cowboy Dressage competitions. I really like River, and I think the feeling is mutual. He’s not the fanciest horse in my barn, but he’s my favorite. He’s been a fantastic partner for me and I’m delighted to have him as my top hand mount. Dave has been with Pat Parelli since 1985. He has been involved with horses since grammar school and the late fifties. He was raised on an oil lease in the western side of the great San Joaquin Valley of California. Being far removed from any town, horses became his primary toys. As a boy he found himself helping the neighbors with problem horses, and was soon teaching kids from town how to ride. It wasn’t until 1985 while starting colts and “fixing” problem horses that he met Pat Parelli at Bishop Mule Days. Certain that Pat was “holding out” on trade secrets, he was dared by Pat to come to a clinic to see for himself the worth of Natural Horsemanship. By noon Dave knew there was something to this technique. He and Pat hit it off and the rest is history. In 1995 prior to the Star Ratings, Dave earned approved instructor status and 1997 saw him as Course Instructor. Since 1997, Pat’s program has kept Dave working nearly every weekend throughout the United States. 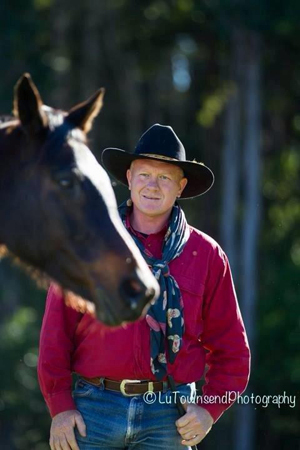 Dave has also taught Parelli Natural Horsemanship clinics in Sweden, France, Australia, Canada, and even Texas. 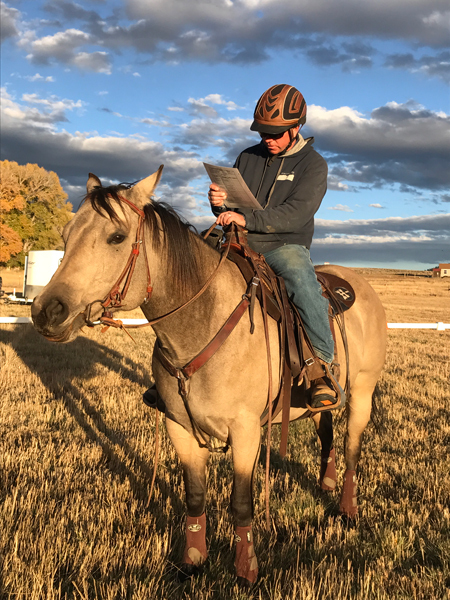 At the Parelli International Study Center in Pagosa Springs, Colorado, Pat has asked Dave teach one week and two week courses covering Level One, Level Two, and Level Three. Dave was asked to teach the final 10 week Horsemanship School at Pagosa Springs. This class was the last one offered prior to the new University style format for the Centers. Pat Parelli advanced Dave to 5 Star Master Instructor in January 2010. As a 6 Star Master Instructor, Dave periodically spends quality time at the ISC either at Pagosa Springs Colorado or Ocala Florida helping students, improving his skills and just enjoying his friendship with Pat. 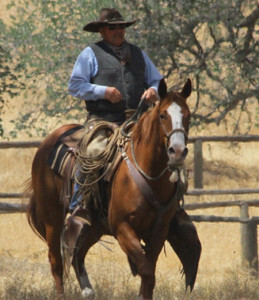 As a Five Star Instructor Dave provides to Pat both horsemanship experience and special corporate skills. David is approved to teach Pat’s programs from Level One through Level Four. In addition he is approved to work with Young Horses, Difficult Horses, to start Colts, and conduct Cow Clinics and other specialty events. David is proud to call Pat Parelli his friend and mentor for over 30 years. Phil Monaghan is a CDWPA level 2 clinician from Australia. 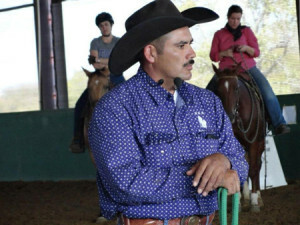 Phil has a special interest in Vaquero style horsemanship. Phil has had an interest in horsemanship for over 35 years. He has ridden and studied with many renowned clinicians throughout his life. Phil’s style has been described as a cross between horsemanship and classical dressage. Phil has competed at the cowboy dressage championships for the past 4 years including the top hand competition with horses supplied by city limits ranch. Traveling each year from Australia with his partner Tanja. Phil is also a accomplished martial artist having competed, trained and taught in The USA, South Korea, New Zealand and of course in his homeland Australia where he runs a full time school with over 200 students. Some highlights of Phil’s career include Medals at the Hanmadang championships in South Korea in 2012 and 2013. Many state and National championships in Australia as well as World Cup victories and a World Championship in the year 2000 at the world Kido Championships. I was born on January 22nd 1970 in Ciudad Juarez, Chihuahua Mexico. As a child I grew up in an urban area with a normal city life. The closest I got to a horse was seeing them pull heavy handmade wagons collecting metal or selling different articles. I also would watch the old Spanish western movies and then, grabbing my mom’s broom, I would go outside with my friends and reenact them. Needless to say, I would get in trouble when my mom looked for it. My favorite thing to do was to visit my great grandmother’s farm. That’s where I knew that one day I would own a horse. At the farm, we knew that every animal there served a purpose; they either provided food or were for work. One day, I was playing on the family’s tractor and my dad pointed out some old mules that were there. He told me some stories about his youth and how when he was fifteen years old he plowed the field with mules. We then moved to California near the Los Angeles area. Life was very different, and every time I went back to my great grandma’s house in Mexico I would go borrow a horse from my uncle and I could not be happier. I joined the military in 1989 and volunteered for deployment to Saudi Arabia prior to Desert Storm with the 1st Marine Division. My first job was corpsman with special units. I decided to become Marine Corps regs and was attached to a sniper platoon until I was honorably discharged in 1996, not knowing I had issues from serving. I was not the same kid that joined and was changed forever. I think God was watching over me and sent me this little sorrel quarter horse mare, that by her marking on her forehead, I named Seven. This was when my love for horses really began. When I felt bad inside, I would go and groom Seven. This helped me calm down and was the best therapy for my PTSD. During this time I joined a local charro team. There, I learned how to fall and fall I did with regularity, looking for that adrenaline rush that I was used to and needed. I became a bronc rider and performed the pasador de la muerte, the leap of death, which consists of jumping from a tame horse to a wild horse at a full gallop. I also did some steer tailing and a little bit of roping. I was the sports commissioner for the U.S. Charro Federation from 2004 to 2008. My job consisted of providing the safety for livestock and competitors while also making sure the event organizers were treating the livestock in a humane way. An important part of my life came when I met master horseman Dennis Reis in 2008 at one of his tour stops. I liked his way of playing with the horses through communication and body language; this is where a lot of my whys & wherefores were answered. I realized I had being doing things not quite so right. I decided to become a member of Dennis’ program and began working on his program. Dennis has a program consisting of 4 courses, and each course has 4 levels. Ten months later, with no help from other instructors, but with a lot of support from my family and two very important persons in my life, I tested to get my endorsements. To my surprise and even Dennis’ surprise; I was able to get all twelve endorsements in the first three of the four courses. He told me at the time that I was only the second person to earn 12 endorsements at one tour stop. At that point, I was qualified to become an instructor. I attended a second tour stop where I earned two more endorsements from course four and a belt buckle with two diamonds. I have earned 14 out of 16 possible endorsements. About three months down the road, I was sponsored to attend the instructor course by the Reis family at their ranch in northern California. Before all of this, I enjoyed teaching my horses not knowing that they were the ones teaching me. Looking back now, I was unfair to them for the lack of education on my part. That’s why every single day, through my work, I try to educate horse owners so they can be fair and have a great relationship with their equine partner. I continue to use some of the techniques learned from Dennis Reis while at the same time implementing my own techniques to help horses overcome their fears, in turn helping their humans to overcome their fears as well. My goal for all horse owners is to become a leader and a partner with their horse. 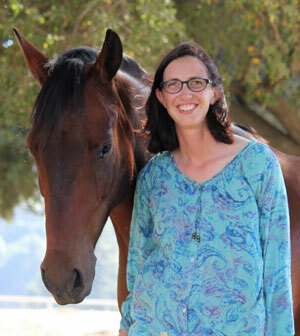 Tanja’s passion is using kind horsemanship philosophies to develop a partnership horse for the rider. Her philosophy develops the horse and rider as a team – to be in tune, flexible, supple, athletic, and confident. Tanja has successfully competed in dressage, western events, and showing. In more recent years (since 2015) Tanja has traveled to the USA from Australia to compete in the Cowboy Dressage world finals and top hand events. For 2 months of the year Tanja starts horses under saddle. 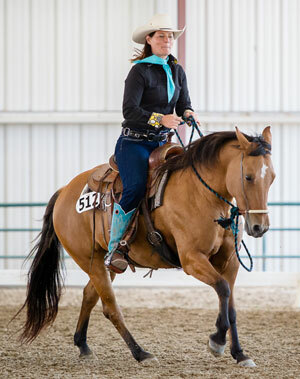 Her patient, knowledgeable and reflective teaching skills have helped riders achieve success in the competition arena, or simply regain their confidence in their horses and themselves. Jesseca is from Norco, in Southern California where she runs J Hutchings Performance Horses as well as maintaining a training and teaching position out of Heavens Ranch LLC. She is currently a Cowboy Dressage Recommended Judge. Having the opportunities as a young rider to explore many different styles of riding and competition, it has always been her belief that diversity is key to good horsemanship. She has competed in everything from Dressage to Cutting horses, Trail trials to Hunter-Jumpers, Arabians, Friesians, you name it! Growing up riding Hunter-Jumpers and expanding into Cutting horses, as well as dabbling in anything that peaked her interest in between, she was a coach and trainer early on in her life. She holds many National and World Titles in many breeds and disciplines. However, such wins do not come without great horses to go with them. Having had a hand in developing all of her winning mounts from a young age, it has been very rewarding to excel with them to such heights. Though she has had great success as a rider and horse trainer, she really has a passion for teaching. Having a great aptitude for making it make sense! Loving the end game of making a horse and rider a pair, and to being a guiding light wherever possible, to achieving mutual understanding between horse and rider be it on the trail or in the arena. 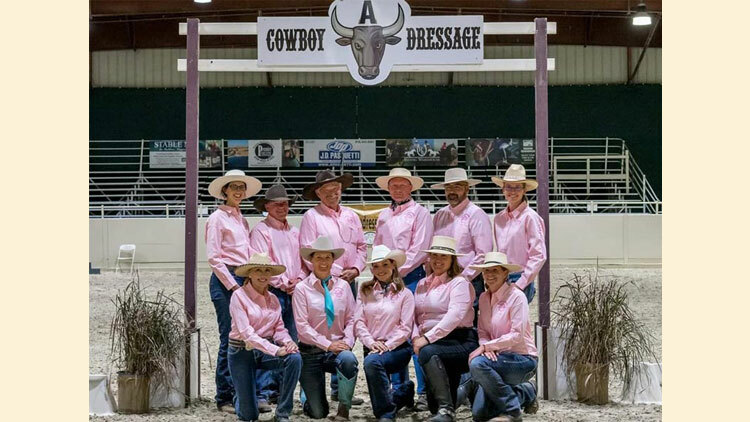 She feels it is such an honor to be able to do a job that she is so passionate about and has found Cowboy Dressage to be the perfect marriage of horsemanship and comradery with a touch of healthy competition. 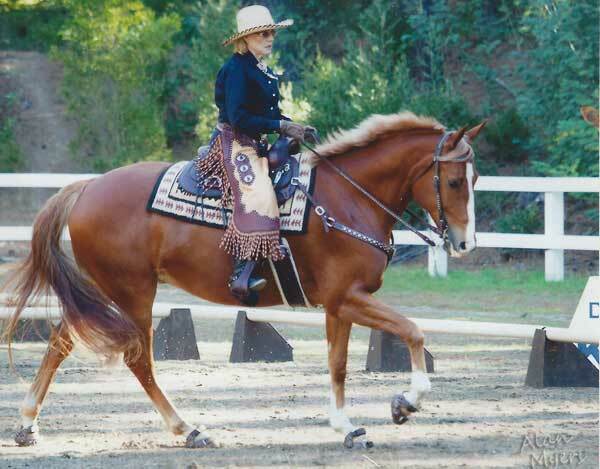 She will be riding One Smart Dual, owner by Jennifer Olds, an AQHA cutting horse gelding! Amy has had a passion for horses all her life and considers herself extremely fortunate to have found a way to make them a part of her everyday life. She grew up in Grass Valley, CA on a small horse ranch owned by her family. Growing up, she spent every spare moment she had in the saddle, often competing in youth divisions for Pony Club and Morgan horse sanctioned breed shows. Throughout her youth, she competed in a variety of disciplines, including hunter seat equitation, pleasure events, western pleasure, pleasure driving, halter and showmanship, dressage and western dressage events When not riding, Amy spent countless hours at not only her barn, but the barns of other local trainers assisting with horse maintenance and care. She spent many hours observing and studying these trainers and their horses. 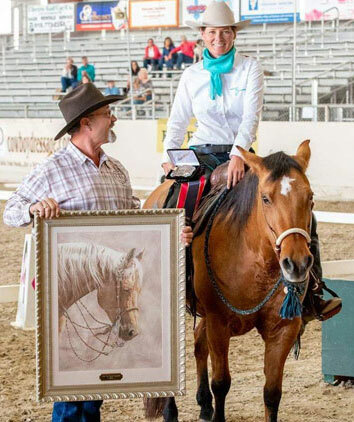 Additionally, Amy sought out lessons and clinics offered by a variety of notable horse trainers/instructors, including Eitan Beth-Halachmy (founder of Cowboy Dressage), Claus Bergener, Susan VanGalder, Sharon Camarillo, Speed Williams and Clay O’Brien Cooper. In high school, Amy continued to compete with Morgans at regional, national and world championship levels of competition. She also took up an interest in barrel racing/high school rodeo events. Amy moved to Bozeman, MT in the summer of 2009 to pursue her bachelor’s degree in Psychology at Montana State University. She loved the university and community so much that she stayed and finished a second bachelor’s degree in Agriculture Education. Then, she moved right into a Master’s of Science in Agriculture Education and completed a college teaching certificate. After graduating in 2014, Amy purchased her current facility and began building her lifelong dream of her very own equestrian operation. Her operation provides riding instruction for youth and adults of all ages, levels and disciplines. Throughout the years Amy has assisted with local community events and organizations, she currently is the leader of the local Gallatin Gallopers 4H Horseless Horse Club. 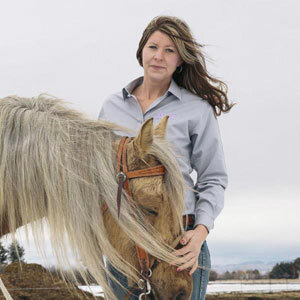 She has also maintained her certification as an Equine Specialist in the Equine Assisted Growth and Learning Association. After hosting summer camps and year-round riding lessons for over 12 years now, Amy is happy to say she is living that dream. I have enjoyed riding many horses in several different disciplines for over 50 years now. As a junior, I showed hunter/jumpers. Later in life I started to learn the basics of classical dressage. Since I was riding Cloud in a western saddle on the trails, a friend told me about Cowboy Dressage four years ago and I’ve been “hooked” ever since. I have won 4 CDW buckles and am proud to say that I came in 6th place in the Top Hand Open competition in 2015. Cloud and I are part of the volunteer mounted park patrol for East Bay Regional Parks, camping partners in the Sierras and have even ridden in two parades this year. We always focus on harmony and partnership! Cloud truly is my “horse of a lifetime”. Heath has worked ranches, outfitting, and starting colts. Heath is now producing a top finished horse, Sparkles. Residing in resort community Crested Butte, Colorado. Heath and his wife, Kirsten Atkins, are currently developing the Crested Butte Horse Park which will be a boarding, lesson, and equestrian educational facility. 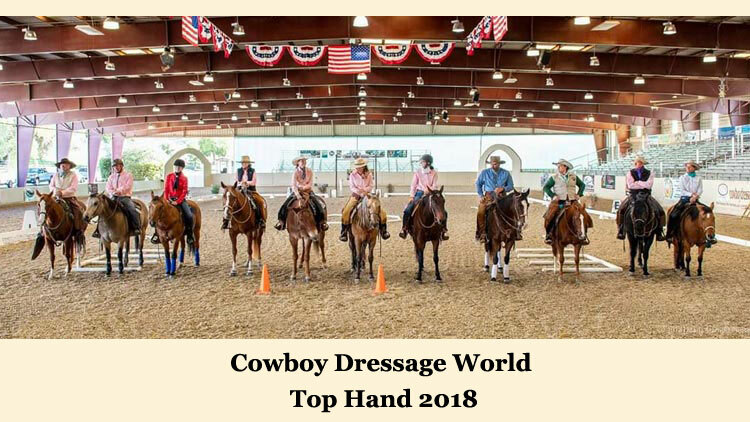 Start looking for Cowboy Dressage clinics, Shows and Gatherings in the Summer of 2020 at the CBHP.